Tony Bates recently posted Who are the founding fathers of distance education? following the release of a Steve Wheeler produced video interview with Tony and other identified “fathers” Michael Moore and Sir John Daniel. As he is, Tony humbly downplays his role, and lists five other suggestions in his post, inviting others to add comment with their suggestions (As he does, Stephen Downes prolifically responds and counters the idea a bit). I do have to say, this in this age of 2016, that it is shocking that someone would put three white men on screen with a label of “founding fathers.” What does it take to consider the impact of language from previously centuries where the norm was suppressing the rights of women and people of color? Yes, it’s “just a phrase”, but to me it’s poor form. I left a comment on Tony’s blog, but his blog never seems to take my comments. I will assume it’s a technical flaw. So I present as an addition to so called “fathers” Anna Elliot Ticknor. I only know of her through a fabulously written Hybrid Pedagogy article by Keith Brennan titled “The Victorian MOOC“. 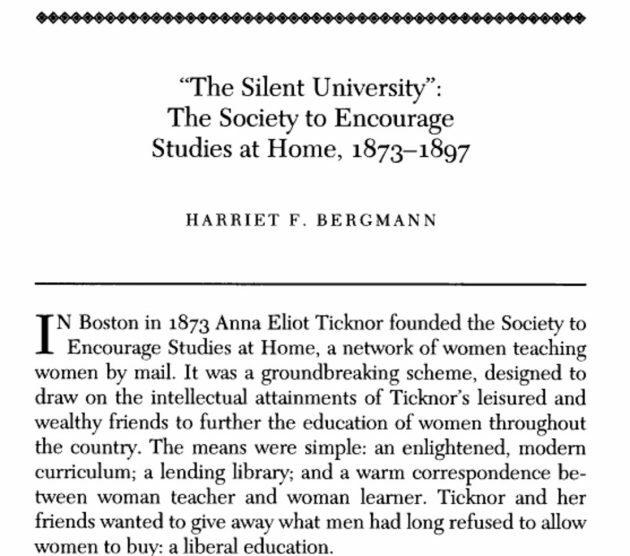 In 1873 Anna Elliot Ticknor created the Society to Encourage Studies at Home — the first correspondence school in the US– to offer education to those excluded from the university system- women. Of multiple skin colors. And yet women, in pursuit of education, opportunity and knowledge sit in drawing rooms, kitchens, porches, and schoolhouses across the continent, opening packages from the same organisation: The Society to Encourage Studies at Home. The packages are filled with books and papers; there are letters crowded with answers, questions, feedback, criticism, resources, learning and encouragement posted from over 200 volunteer Society teachers — almost exclusively women. The Society to Encourage Studies at Home is a 19th century network of women who connect across the continent over the postal system. Women may be significantly disbarred from third level education, but they are not disbarred from organising, networking, connecting and educating. And this is what they do. They organise and educate one another. They organise departments, schools, libraries, curriculum, instruction and education. An institution. On a massive scale. They reach out to ten thousand students over twenty-four years. It is a massively open postal university. With 200 volunteers they ‘leveraged the postal service — the most advanced, accessible and democratising information technology of their day — to provide support, education, opportunity, and resources to women regardless of race, location, class, or financial disposition. Women who were actively, explicitly, and implicitly excluded from education. It’s the story of an ed-tech revolution that came to be called the “Silent University”’ In 24 years they educated over 7000 women and and a claimed MOOC stomping success rate of 65%. The desperate need was not only for content — books, essays, curriculum. It was for content resourced with access to empathetic expertise. The warmth, support, empathy, and understanding that were at the heart of the project seem key. So were the resources and method. Ticknor’s own ethos was one of warmth, encouragement, support, access to resources, and regular access to expert instruction and feedback. Each learner had an instructor. Each instructor regularly corresponded with their student. Each student stayed with an instructor for a long time and corresponded back and forth. Each relationship was allowed to determine its own course. And each instructor followed their students development closely. Reading their notes, reading their essays, setting their exams, setting their reading in response to their needs. That, of course does not “scale”, so we leave personal “warmth, encouragement” to the side for click counts and bot graders. If History has forgotten the Society, and eduprenuers have usurped innovation, then Thrun’s pivot, and EdX and Coursera have also forgotten the dispossessed. The Society achieved something that modern mooc innovations have so far failed to do: Openness. Access. Egalitarianism. The failures of history are condemned to repetition if we fail to listen. The successes are available if we care to tend to the past. The core lesson of what has been termed the paleo-history of education technology is perhaps this. Edtech is not disruption. It’s iteration. Thin even of the nurturing name for this Silent University — Society to Encourage Studies at Home — not about bringing Ivy Leagues to the poor around the world, not about disrupting education, not about promotion for the sake of counting registration numbers, not about getting a certificate. Just the encouragement for studies at home. Go Anna, you are as much a father founder as the others. Founder of the very first correspondence school in the U.S.
Ha! Bravo! Very well done on multiple fronts. You rock, Anna! I’d shove in some other suggestions. UNISA in South Africa maybe. Providing correspondence education (at least in theory) to all South Africans right through apartheid. Possible the first University also to offer full degrees completely by distance. A problematic one, as UNISA was at times headed up by pro apartheid provosts. But a key one. Founded in 1873 as the University of the Cape of Good Hope. Or Jan Comenius, the pan educationalist who released Orbis Pictus, a book/picturebook designed to provide access to education for all. In 1658. So men and women could all be educated equally. But Ticknor is key, and forgotten, and hugely important and inspirational. And thanks for thinking of my article. I think you;ve made the perfect point with it. The ‘founding fathers of distance edcuation’ phrase was actually contributed by Steve Wheeler, who put it in the title of his video. I replaced with with ‘founders of distance education in my post. Also in my post I drew a distinction between using text-based correspondence to support education, which of course dates to the invention of writing. Otherwise the attribution of ‘founder’ is very arbitrary and culturally specific. I instead prefer to date the beginning of distance education with the invention and use of radio to support education, which as I suggest involves pioneers from around the world including both men and women. “invention of use of radio”….was certainly the starting point here in Australia. In Australia this was innovated with a pedal-powered version by Alfred Traeger (German origin, Australian born, white of skin, often wore suits) which enabled it to be used where there was no generator power available. As per my comment below, it was a Adelaide Miethke (Prussian origin, Australian born, white of skin, often wore suits and hats) that saw a potential on the education side. Ooops, I should have been clearer Stephen that your post criticizing the “fathers” part got me started down this road. However, I think cutting off the distinction at radio is arbitrary. Defining who founders are is not the big deal, it is appreciating the influences into the development of distance education. And *I* think that correspondence courses, not just writing itself, definitely are the forerunners to distance ed (many modern ones mimic the form). Both my father (http://cogdogblog.com/2011/05/may-story-a-day-25-dad-was-a-distance-learner/) and his father (http://cogdogblog.com/2015/05/my-grandfather-was-kind-of-a-big-deal/) got their education in the construction fields through correspondence schools. i already tweeted my love for this – thanks Alan for making this really important point. If someone just says “founders” and removes fathers but still only mentioned white men, you still have a problem. So thanks for bringing up this piece by Keith Brennan which I had the pleasure of peer-reviewing. On another note. Founders of connectivism? White men ;) s’ok. I can live with that. > If someone just says “founders” and removes fathers but still only mentioned white men, you still have a problem. Well that would depend on what actually happened, wouldn’t it? If something were founded in the 1920s by three white men,then that’s who I would mention. Not much choice there. As it turns out, though, I was not required to limit myself to white men. Historically, men and women of various ethnicities were involved in the founding of distance education. That wasn’t my doing, though. My addition to this list is Miss Adelaide Miethke for seeing “other ways” a primarily medical/health radio network could be used. The School of the Air has gone digital a long time since and is still a driving force for education in remote areas of Australia. Thanks for this, Wendy- one of my first thoughts was definitely School of the Air; and i did not know the woman behind the idea. Thank you Alan. I saw the Steve Wheeler title and banged my head on my desk again – couldn’t even be bothered to look. Tony mentions Jennie Lee (our Library is named after her), which is good. I suspect if she were still with us, Robin Mason would deserve to be on that list in the transition to online ed (where does founding stop?). I like hearing John Daniel and Toby Bates speak, so no problem there (I don’t really know the other chap), but the whole grouping together as “founding fathers” – sheesh. Anyway, thanks for good corrective action here. But thank you for the Anna Eliot Ticknor suggestion. This was completely new to me and a wonderful example. I would think that someone might have mentioned St. Paul, who was heavily involved in distance education in the first century. William Bathe, an Irish Jesuit monk working in Spain in the 16th century preceded Comenius in writing one of the first textbooks, enabling distance education. 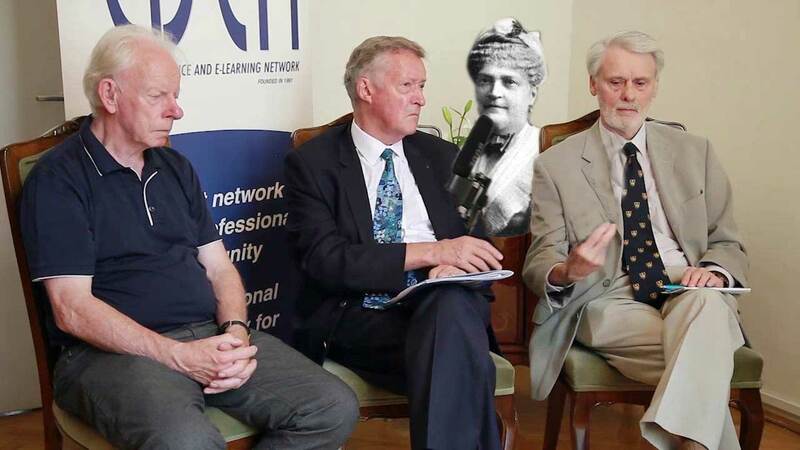 I did notice that the three experts were considered founders of “modern” distance education. I would think that “modern” would be online education, which I believe was led in the mid-1980s with women like Linda Harasim, who taught the very first fully online course and Marlene Scardamalia with CSILE both at OISE and Robin Mason at OUUK. That’s why I made the cut-off at wireless education. Otherwise we can give credit (as I sometimes do in my talks) to aboriginal cave paintings. Interestingly, I wouldn’t consider Bates, Daniel and Moore to be the founders of *online* learning at all. They are definitely specialists in open and distance learning (and are joined by many others), but online learning comes along later in their careers and is, to my observation, founded by other people. Yet it’s not a contest or some badge. I’d rather cast a wide net to learn more about people who influenced the field rather then putting up fences. I was reminded of this post today because of a Tweet https://twitter.com/suzankoseoglu/status/1105413800923222018?s=21. Wow, what an interesting find, especially as it is something different what I was writing about, yay for serendipity.